Joining the ranks of Hidden Figures and In the Garden of Beasts, the incredible true story of the greatest codebreaking duo that ever lived, an American woman and her husband who invented the modern science of cryptology together and used it to confront the evils of their time, solving puzzles that unmasked Nazi spies and helped win World War II. In 1916, at the height of World War I, brilliant Shakespeare expert Elizebeth Smith went to work for an eccentric tycoon on his estate outside Chicago. The tycoon had close ties to the U.S. government, and he soon asked Elizebeth to apply her language skills to an exciting new venture: code-breaking. There she met the man who would become her husband, groundbreaking cryptologist William Friedman. Though she and Friedman are in many ways the "Adam and Eve" of the NSA, Elizebeth's story, incredibly, has never been told. In The Woman Who Smashed Codes, Jason Fagone chronicles the life of this extraordinary woman, who played an integral role in our nation's history for forty years. After World War I, Smith used her talents to catch gangsters and smugglers during Prohibition, then accepted a covert mission to discover and expose Nazi spy rings that were spreading like wildfire across South America, advancing ever closer to the United States. As World War II raged, Elizebeth fought a highly classified battle of wits against Hitler's Reich, cracking multiple versions of the Enigma machine used by German spies. Meanwhile, inside an Army vault in Washington, William worked furiously to break Purple, the Japanese version of Enigma--and eventually succeeded, at a terrible cost to his personal life. Fagone unveils America's code-breaking history through the prism of Smith's life, bringing into focus the unforgettable events and colorful personalities that would help shape modern intelligence. Blending the lively pace and compelling detail that are the hallmarks of Erik Larson's bestsellers with the atmosphere and intensity of The Imitation Game, The Woman Who Smashed Codes is page-turning popular history at its finest. In 1916, a young Quaker schoolteacher and poetry scholar named Elizebeth Smith was hired by an eccentric tycoon to find the secret messages he believed were embedded in Shakespeare's plays. She moved to the tycoon's lavish estate outside of Chicago expecting to spend her days poring through old books. But the rich man's close ties to the U.S. government, and the urgencies of war, quickly transformed Elizebeth's mission. She soon learned to apply her skills to an exciting new venture: codebreaking--the solving of secret messages without knowledge of the key. Working alongside her on the estate was William Friedman, a Jewish scientist who would become her husband and lifelong codebreaking partner. Elizebeth and William were in many ways the Adam and Eve of the National Security Agency, the U.S. institution that monitors and intercepts foreign communications to glean intelligence. In The Woman Who Smashed Codes, Jason Fagone chronicles the life of this extraordinary woman who played an integral role in our nation's history--from the Great War to the Cold War. He traces Elizebeth's developing career through World War I, Prohibition, and the struggle against fascism. She helped catch gangsters and smugglers, exposed a Nazi spy ring in South America, and fought a clandestine battle of wits against Hitler's Reich, cracking multiple versions of the Enigma machine used by German operatives to conceal their communications. And through it all, she served as muse to her husband, a master of puzzles, who astonished friends and foes alike. Inside an army vault in Washington, he worked furiously to break Purple, the Japanese version of Enigma--and eventually succeeded, at a terrible cost to his personal life. Fagone unveils for the first time America's codebreaking history through the prism of one remarkable woman's life, bringing into focus the unforgettable events and colorful personalities that shaped the modern intelligence community. 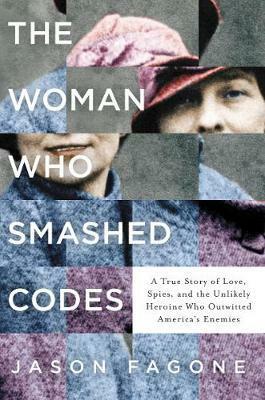 Rich in detail, The Woman Who Smashed Codes pays tribute to an unsung hero whose story belongs alongside those of other great female technologists, like Ada Lovelace and Grace Hopper, and whose oft-hidden contributions altered the course of the century.